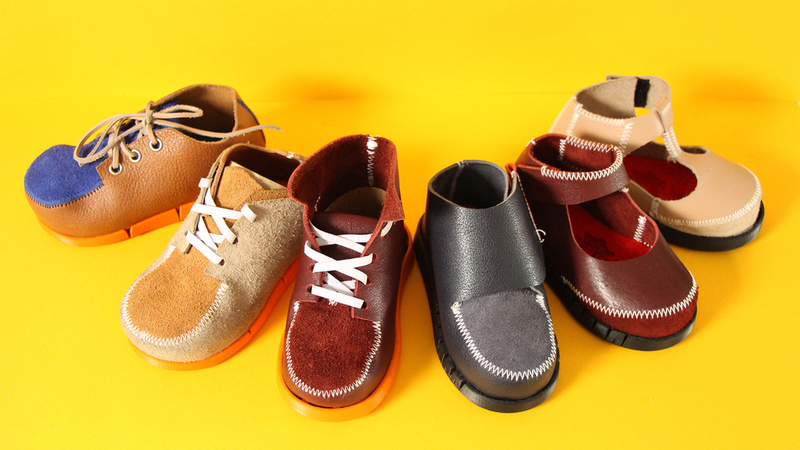 Student looks into using material offcuts to create a sustainable range of children’s shoes. According to World Footwear, over 20 billion pairs of shoes are produced worldwide every year. In the UK alone, approximately 300 million pairs end up in landfills after they have been worn. In response to this, footwear brands are coming up with waste-free technologies and methods of manufacturing, organisations are creating shoe reuse and donation programmes, and design students are bringing awareness to the issue with smart solutions. Royal College of Art student Thomas Leech is making his contribution with Shoey Shoes, an exploration into the use of leather offcuts to create a range of sustainable shoes for children. Traditionally, manufacturers cut shoe parts from large sheets of fabric, a process that results in roughly 30 per cent of material that goes to waste. Leech proposes taking this leftover fabric from the fashion industry to develop a line of children’s shoes that are easy to disassemble for reuse or recycling. This reuse approach is a potential solution for the sustainable production of children’s shoes as Leech points out that “children’s feet grow half a shoe size every three months, so shoes are normally outgrown before they are worn out”. By repurposing leather offcuts and also reusing material from worn shoes for the fabrication of new or restored shoes, Leech is promoting a circular economy model for children’s shoes. The subscription-based scheme would allow outgrown shoes to be sent back to the manufacturer where it would be dissembled and used to create new shoes entirely from waste materials.